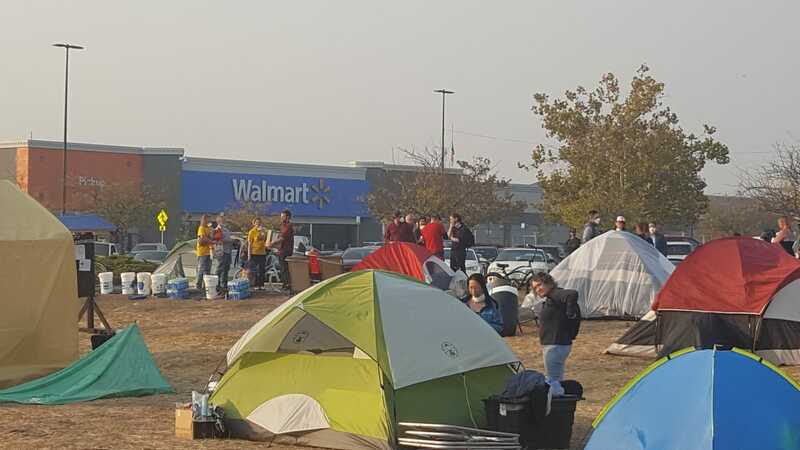 People displaced by the Camp Fire shelter in a Chico Walmart parking lot. Nov 18, 2018. As of Monday, November 19, huge fires are still burning across California. The most destructive fire, by far, is the Camp Fire in Butte County, which has killed at least 85 people. Over 993 people are missing in the wake of the fire, and the blazes have destroyed 18,793 buildings and burned 153,336 acres. Tens of thousands of people have been forced to evacuate their homes. The fire has produced a blanket of smoke over northern California, endangering millions of people as far as the East Bay and San Francisco. Fault for the Camp Fire, like many of last year’s deadly Wine Country fires, can likely be laid at the feet of the Pacific Gas & Electric Company. The Wine Country fires consumed at least 245,000 acres and killed 46 people. Many fires were traced to damaged PG&E power lines, and in the vast majority of cases it was found that the company violated state safety laws. The fires left PG&E liable for billions of dollars in damages, but the company successfully lobbied the state legislature to lower its liability and to allow it to push much of its costs onto ratepayers. All of this happened on the heels of a 2017 rate hike that drastically boosted PG&E’s profits. In other words: PG&E started some of the worst fires in the state’s history, and received a bailout in return. The effect was a large transfer of resources from ordinary people to the executives and shareholders of a rapacious corporation. The company is responsible for the fires at a deeper level as well. California’s weather conditions in the age of global warming--insufficiently rainy winters followed by extreme drought conditions from May to November--makes it very easy for fires to start and spread rapidly. These extreme weather conditions are effects of human-made climate change, and power utilities like PG&E are among the largest contributors to the greenhouse gas emissions which drive climate change. Unsurprisingly, the biggest electric companies are fierce and powerful opponents of renewable energy, stalling efforts to stem irreparable damage to our atmosphere. PG&E itself has fought to make clean energy more expensive for California residents. The stage is set for history to repeat itself. Camp Fire victims are suing PG&E for damages, and the company’s stock has plummeted as investors worry about its liabilities. It is all too likely that the company will attempt to get out of paying victims, and to shift remaining costs onto customers and taxpayers. And the legislature will probably oblige. That’s not all. California’s dependence on PG&E means that potential damage to the firm’s credit rating threatens the state’s ability to transition to clean energy. The irony would be delicious if it weren’t so infuriating: PG&E’s negligence, together with extreme climate conditions, starts fires that cause massive devastation; the resulting damage to the company’s finances means that the state is less able to take action to address the climate crisis. At 48 Hills, Tim Redmond makes a strong case for a state takeover of PG&E. Chico DSA has also released an analysis of the crisis calling for a state takeover. The fires, and the company’s reliance on the state to bail it out, show that PG&E can’t be trusted with the essential function it serves in our society: safely providing energy to two thirds of the state. They shouldn’t be allowed to enrich their executives and shareholders while the public pays the costs of their negligence. (As Redmond notes, a parallel argument can be made for nationalizing the big banks that caused the Great Recession.) If PG&E were state-owned, its revenues could be re-invested toward making life-saving maintenance upgrades to the system while transitioning to a green energy infrastructure. But a state takeover of PG&E doesn’t go nearly far enough. PG&E is just one of many out-of-control utility corporations that are fleecing the public and destroying our planet. The recent report by the Intergovernmental Panel on Climate Change says that the we must cut greenhouse gas emissions by 45% in the next twelve years, and by 100% by 2050, to avoid catastrophic climate effects. Meeting these goals requires breaking the power of the big corporations who contribute the most to climate disaster and who will continue to relentlessly pursue profits at the expense of humanity. If we want utilities that truly serve human needs, and a shot at preventing the worst effects of climate change, we must abolish all private utilities. Energy joins water, waste disposal, telecommunications, and transportation as essential services that must be brought under full democratic control, with revenues being reinvested in providing better, greener service at lower rates to the public. Companies like PG&E are reckless because they have no incentive not to be. As a private corporation, PG&E is beholden to its shareholders, and it satisfies shareholders by maximizing profits. If that requires breaking safety laws and causing dozens of deadly blazes, so be it. Nor do private utilities need to worry about negative consequences. As the saga of the Wine Country fires shows, PG&E can rely on the state to bail it out if it gets into trouble. This dynamic gives utilities strong incentives to engage in dangerous practices in the pursuit of profit. The goal of utility companies should be to safely provide the public with essential services. But privately owned utilities cannot fulfill this goal, because they are subservient to the profit motive rather than human needs. Bringing all utilities under state control would make them democratically accountable, remove incentives for negligence, and allow badly needed revenues to be re-invested in public services. Perhaps most importantly, it would neutralize some of the most powerful forces behind disastrous anti-climate practices and policies. Abolishing private utilities would therefore be a big political victory in the struggle of working-class people against billionaires and corporations. It would bring us that much closer to a world that puts people over profits, and give us a fighting chance at preventing a climate catastrophe.